John’s extraordinary ability to inspire and teach people how to become partners with their horses has launched a global training career that has spanned over 25 years. 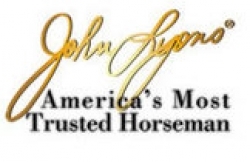 After a successful show career and gaining practical horse knowledge on his Colorado cattle ranch, John began giving training clinics and symposiums in 1980. With a background in education, he recognized people were eager for help with their horses and developed an extremely successful, solid training program that is unsurpassed.